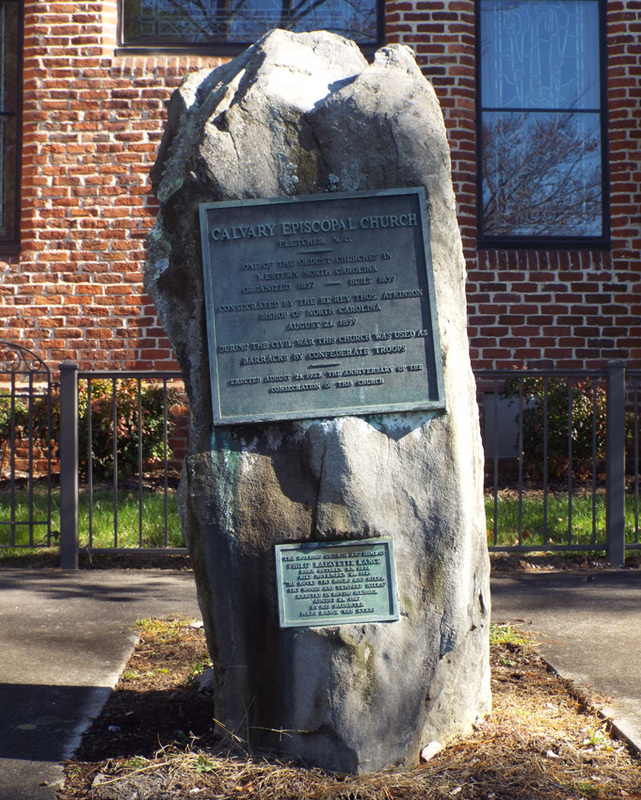 The Calvary Episcopal Church memorial consists of two simple plaques attached to an irregular shaped granite shaft. The upper plaque gives the history of the church to include its use as a Confederate barracks in the Civil War and the lower plaque is to a long time member of the church whose family sponsored the memorial. Images: Upper plaque | Lower plaque | Calvary Episcopal Church Memorial | View of memorials at "Westminster Abbey of the South"
Church Plaque, top: CALVARY EPISCOPAL CHURCH / FLETCHER N.C.
Calvary Episcopal Church is located at 2840 Hendersonville Road at its intersection with Old Airport Road in Fletcher. The marker is near the front entrance of the church. Eighteen “Open-Air Westminster Abbey of the South” markers stand in two rows in a lawn area facing Old Airport Road to the right of the church. The Robert E. Lee Dixie Highway is located near the street facing Hendersonville Road. One memorial to Bill Nye is in the church cemetery and the second memorial to Bill Nye is on the front lawn of the church. 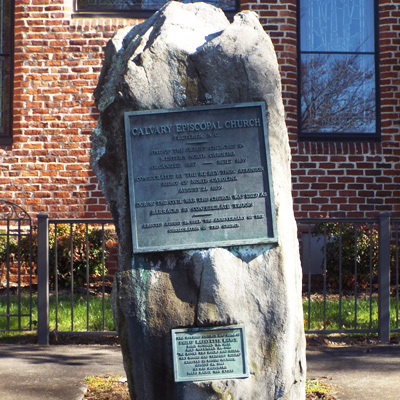 The marker stands right in front of the Calvary Episcopal Church.